Colonel Stephen M. Golden MD, had a brilliant tri-service career serving for over 40 years in the United States Navy, Army and Air Force. A graduate of Boston University, he attended New York University School of Medicine and entered active duty in 1973 upon completion of his Pediatric training at the Univ. of Colorado and Univ. of Arizona medical centers. His initial duty was as a Pediatrician at the US Navy Hospital in Guam. During this time, doctors were sorely needed in the South Pacific, and he received temporary additional duty assigned to the USS Quapaw, which was headed for the Trust Territories in Micronesia. This entire experience proved to be a watershed moment in his life, for he came to understand the sacrifice and dedication of our sailors. Arriving in the waters of Micronesia at Ulithi, Falealop, Sorol, and Palau, this young and adventurous doctor climbed down a rope ladder from the deck of the ship to a rubber raft, where he and his shipmates paddled through fierce surf onto the beaches. He provided basic medical care to grass-skirted women, men, and children in the shade of palm trees and thatched roofs. In 1975, late at night while serving his Emergency Room duties, he received a call from his commanding officer directing him to meet a Flying Tiger Airline flight carrying sick and injured Vietnamese children being evacuated from their war-torn country. He was assisted by a first-class staff: a nurse, a corpsman, and an ambulance driver, who helped triage and move sickest of these children to the Navy Hospital. Dr. Golden’s Commanding Officer was impressed with how he handled the situation! He was appointed as Head of Medical Reception for all of the over 100,000 Vietnamese refugees just as the floodgates opened! As Viet Nam started to fall, C-130’s landed in droves, each bringing hundreds of refugees. As the first wave of Vietnamese deplaned, the Loadmasters would hand over boxes of knives and guns collected on the flight. “Here, Doc!” they’d say. Next came the Boat People. After two weeks at sea with no toilet facilities, a massive admission of pediatric cases was inevitable. Dr. Golden and his two fellow Pediatricians set up an open ward at the hospital, with beds lining both walls and a row of beds in the middle. Dehydrated kids would receive glucose and electrolytes through IV’s that were hanging by a nail. With 20-40 admissions per day, hospital beds had to be shared. Mattresses were placed at each end of the bed and raised in the middle. Family members of each patient slept on the floor beneath every bed. As refugees flooded in by the thousands, the newborn deliveries rose five-fold from 30 to 150 births per month. The Navy ordered every incubator it could find transported to Guam from naval facilities all over the world. Bassinettes were placed on top of incubators. It was crowded beyond belief, but Dr. Golden and his crew did an amazing job caring for these children and their families; amazingly, only two children died— one with diphtheria and one of Dr. Golden’s patients with dengue fever. He still vividly remembers this patient. After serving two years as Staff Pediatrician at the Naval Hospital in Guam, Dr. Golden left for Fitzsimons Army Medical Center near Denver for his fellowship in Neonatal-Perinatal Medicine. There he spent two years before being assigned to the National Naval Medical Center in Bethesda, Maryland, where he served as Director of the Newborn Branch. Still in the Navy, he was assigned to the Uniformed Services University of the Health Sciences (USUHS) achieving the academic rank of Associate Professor. At USUHS he established the medical curriculum for Neonatology, a research laboratory for perinatal medicine, and the still extant Neonatal-Perinatal Medicine fellowship program. A man of enormous energy, he not only taught medical students but had the additional duty of being an Assistant Commandant of Students. Many of his students were interested in learning to jump out of an airplane. So—at the age of 35— Dr. Golden went right along with them. 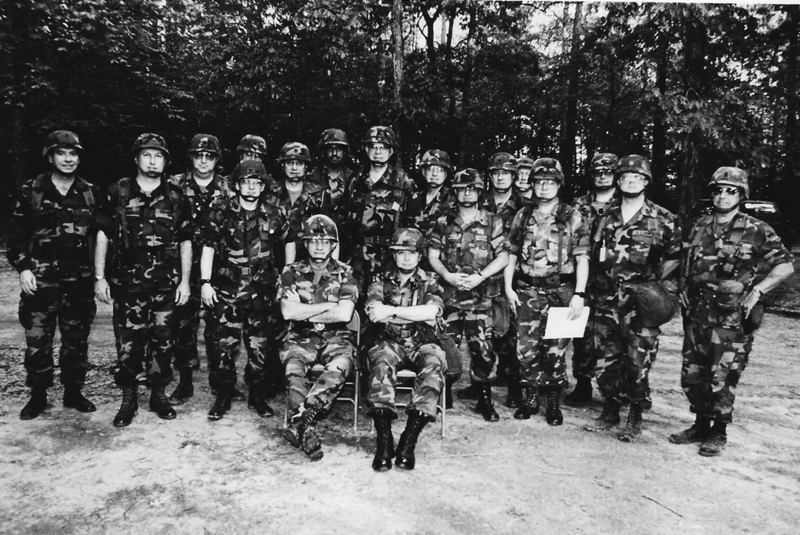 They were trained as paratroopers and received their Army jump wings at Ft. Benning, Ga. Their trainers were called “Black Hats,” famed for sending their trainees on 8-mile runs wearing combat boots. During these runs, a Black Hat would often hand then Commander Golden a bag of bricks which he would run with until other members of the class would race up to and take them. It was a test of comradery. Upon returning to USUHS, he completed additional parachute jumps at Marine Corps Base Quantico and received his gold Navy and Marine Corps Parachutist Badge. He also completed training and received the Army’s Expert Field Medical Badge—considered the most difficult and prestigious Army special skill badge to earn. The requirement for this badge includes demonstrated expertise in patient triage, transport, chemical warfare casualty care and land navigation skills—including a very arduous nighttime compass course with M-16s and combat gear. After ten years of active duty, Dr. Golden entered the Navy Reserves and moved to New Jersey, where he became Associate Clinical Professor of Pediatrics at Columbia University. 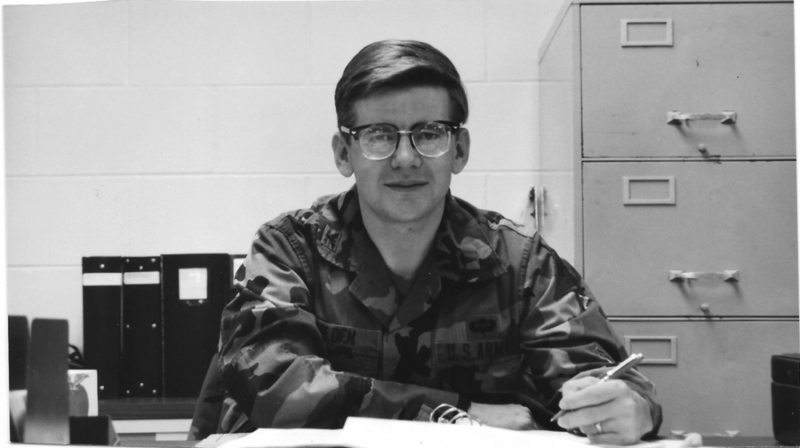 The Navy allowed then Commander Golden to transfer to the Army Reserves, which was more compatible with his specialty and enabled him to continue to work with medical students from USUHS. However after a year, Dr. Golden, now an Army Colonel, received a call from the New Jersey Army National Guard (NJARNG) State Surgeon asking him to become Division Surgeon of the 50th Armored Division, NJARNG. Dr. Golden accepted this position which he held for 10 years. 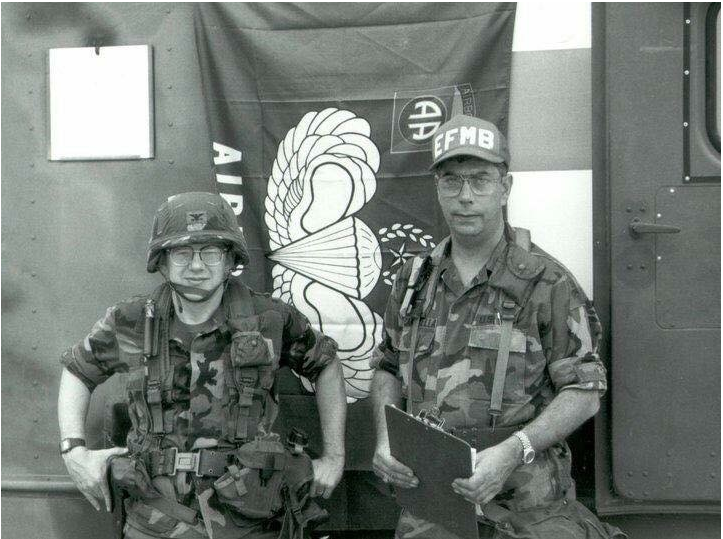 During this time, the Army wanted all Division Surgeons to become qualified as Flight Surgeons and he completed his Flight Surgeon training at Ft. Rucker, AL in 1992. The Army Medical Department also recognized and highly honored Dr. Golden and his 50th AD medical staff in allowing them to conduct Expert Field Medical Badge training and testing. After 10 years of civilian life, Dr. Golden missed serving members of our uniformed services and their families. Only the Air Force had one position available in his medical field at that time; he was interviewed at Travis Air Force Base in Fairfield, CA and in 1995 was released from the Army National Guard. He entered the Air Force with an initial assignment as Director of Neonatology at David Grant USAF Medical Center (DGMC). He completed Air War College while at Travis AFB and was subsequently appointed to be Chief of the Medical Staff of DGMC—responsible for the medical care and medical staff activities of the Air Force’s second largest medical facility serving over 400,000 beneficiaries. While at DGMC he also completed USAF Flight Surgeon training and hyperbaric medicine training—and provided expert clinical care in these medical subspecialty areas as well as Neonatology. In addition to these professional activities, Col Golden was Executive Director of the Travis AFB Fisher House and served as an executive member of the Greater San Francisco area Combined Federal Campaign Cabinet. Dr. Golden retired from the USAF in 2006. His medals include the Defense Meritorious Service Medal, Air Force Commendation Medal, the Humanitarian Service Medal with three oak leaf clusters, and the Navy-Marine Corps Overseas Service Medal. Colonel Golden’s bio is lengthy and stellar. He has served on almost two dozen civic boards including the New Jersey Children Relief Fund Commission, the March of Dimes, and the YMCA, to name but a few. He has received a myriad of academic awards and honors, published dozens of articles, chapters, and abstracts, and has given a multitude of presentations at national meetings. Since 2007, he has served as Enterprise Medical Director for Neonatal Utilization Management at Anthem Corporation. Stephen Golden and his wife, Karen, moved to The Landings four years ago, where they are happily ensconced in a treehouse.